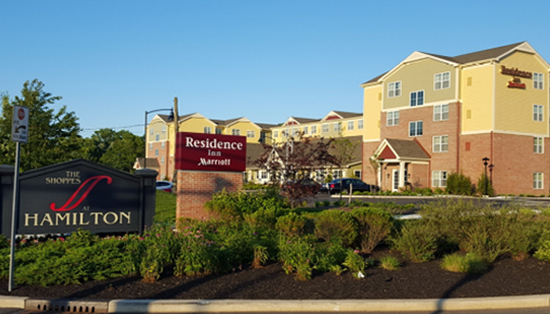 Hamilton Township, Mercer County, NJ – Briad Construction Services chose CES to provide full construction surveying services for its latest Marriott Hotel on Route 130. The initial efforts were to identify control points and lay stakes for initial grading. Later surveying involved all aspects of the parking areas, utility lines, stormwater management, building, pool, and an imaginative multi-sport (pickleball) outdoor court. While the surveying was hindered by the large amount of work vehicles on site at any one time, CES personnel worked with the site superintendent to assure all relevant points were available as needed. Lastly, CES surveyed the final construction and prepared as-built surveys and an ALTA survey to the level required for permanent financing and release of any bonds.